As part of a plan to embrace Kentucky bourbon as well as thoroughbred horse racing, the Kentucky Derby Museum kicked off a new Legends Series on Jan. 9. 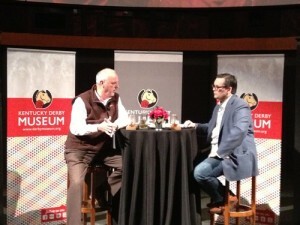 Author Fred Minnick (right), hired in October by the Museum as its “Bourbon Authority,” conducted a Q&A with Jim Rutledge (left), master distiller of Four Roses, and the distillery offered a tasting of four rare bourbons: the 2013 Limited Edition Single Barrel and Small Batch (the latter named 2013 American Whiskey of the Year by Whisky Advocate), the Single Barrel selected by Secretariat owner Penny for a bottling marking the 40th anniversary of her horse’s Triple Crown sweep, and, most rare of all, the Single Barrel she chose for a decanter that ultimately was not released because of production issues. The Legends event was, in fact, the first public tasting of that particular bourbon – and if you weren’t one of the 30 or so people there, let me tell you, you missed out on some good stuff. •The juice for Bulleit Bourbon is produced at Four Roses Distillery in Lawrenceburg, Ky.
•Jim Rutledge can pass judgment on a barrel based on just a drop on his tongue. That’s how he once judged 64 barrels in one sitting: The cumulative amount equaled about two to three drinks. The next Legends Series event is a March 6 Q&A and tasting with Ed Foote, the fifth and last master distiller for Stitzel-Weller. See you there.